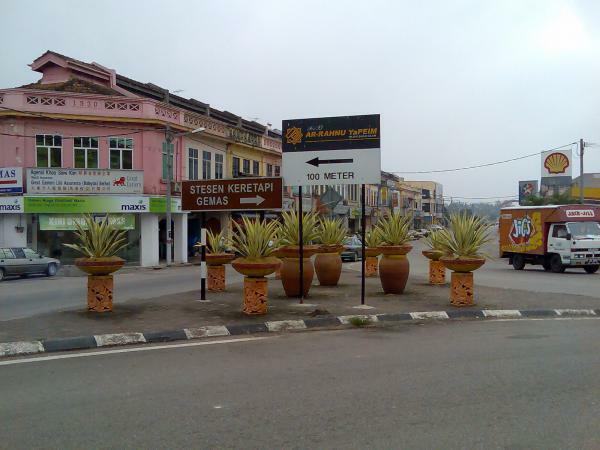 Gemas is a transport town in Tampin district, Negeri Sembilan. It is notable for being at the main junction of Malaysia's rail network and approximately half-way between Kuala Lumpur and Singapore. In Gemas lies a railway station that becomes the most important link as the crossing of the West and East rails from the South. There is not much to do or to see but you might need to stay a couple of hours waiting for the next train or end up staying overnight. It is a small town and you can walk around the city centre in about 10 minutes. Trains on the Jungle Railway run to Tumpat, near Kota Bharu and the Thai border, in Kelantan. Heading south, the major stops are Johor Bahru and Singapore. 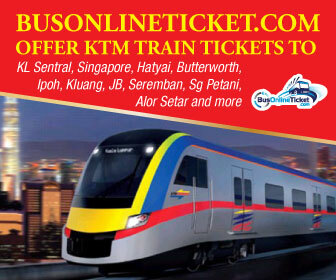 Northbound, trains head as far as Butterworth, via Kuala Lumpur. Given that Gemas is a busy junction that every train in all directions stops at, this mean the counter will be open on-and-off for most of the evening and night. 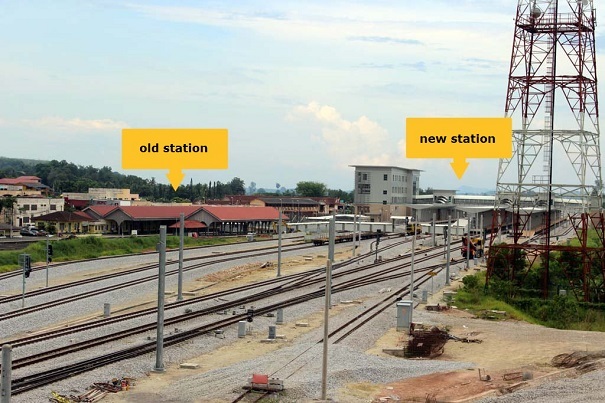 The Gemas railway station was built in 1922 and since then the station became 'pulse' connecting the inhabitants of the Malay Peninsula, especially in Pahang and Kelantan. However, the old railway station was transferred to operation in 2013 at a new railway station not far from here. Although the station has been moved to a new station, the old station's structure remains and the old carriages are still on the runway. Just waiting for time to be disposed. A lot of people are hoping that the government will take into consideration making this old railway station to a museum or historical building. It's important that future generations can see and experience the history of our railroad development sometime. 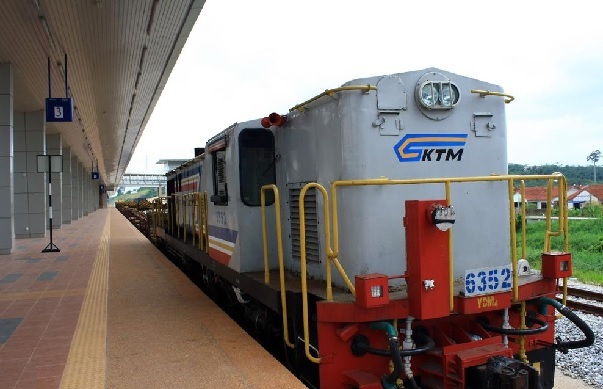 Given its importance as a railway hub and unimportance in every other respect, Gemas is usually accessed by train. 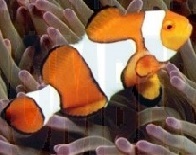 In Gemas is a shopping mall which houses a variety of goods sold in wholesale and retail. This area of 165 hectares has 750 stores and was introduced in December 2001. Among the items here are handicrafts, furniture and clothing such as clothes, scarves, telesales, ties and other textile items. In addition, there are also various wedding accessories, car accessories and home jewelry items such as jewelry, carpets and curtains. Like most Malaysian small towns, Gemas, is not constrained by the logic of urban planning and knots of settlements are strung every kilometer or so along the main road. This means that the entirety of Gemas, if you count these surrounding villages, can only been seen if you have wheels. However the streets closest the railway station provide everything you will need (hotels, shops, restaurants, internet) within easy walking distance so you can easily get a flavour of the place without having to take a taxi. Shopping is basic. If you like cheap nasty plastic clothes and footwear, you're in luck. A 7-eleven can be found on the second street to the right as you head out of the station. A rather exciting night market awaits.......as you breeze through little stalls set up only at night, selling mainly accessories, lighters, sunglasses, toys, street food, and gifts ideal for souvenirs. Anyone emerging from the disappointing cuisine of the trains will likely end up in Curry Point or Wang Lai in the row of shophouses on the left on the street straight out of the station exit. This is fortunate as both these near neighbours are surprisingly good quality and good value. There is an internet cafe close to the train station. Turn right at the first intersection and after about 50 m on the right side is a small doorway with a sign "cybercafe". Budget for sleeping options are very close to the station, look for the large "Hotel" signs close to the station's exit. Both are basic, though a hand basin in each room is standard. The main entrances remain unlocked at night, but finding someone to let you in after a late arrival can be a challenge. Don't be afraid to ask the slightly out of place looking loiterers nearby for help; they may just be the owner.